Coenzyme Q10 is an essential cofactor in the respiratory chain and serves in its reduced form, ubiquinol, as a potent antioxidant. Studies in vitro and in vivo provide evidence that ubiquinol reduces inflammatory processes via gene expression. Here we investigate the putative link between expression and DNA methylation of ubiquinol sensitive genes in monocytes obtained from human volunteers supplemented with 150 mg/ day ubiquinol for 14 days. Ubiquinol decreases the expression of the pro-inflammatory chemokine (C-X-C motif) ligand 2 gene (CXCL2) more than 10-fold. Bisulfite-/ MALDI-TOF-based analysis of regulatory regions of the CXCL2 gene identified six adjacent CpG islands which showed a 3.4-fold decrease of methylation status after ubiquinol supplementation. This effect seems to be rather gene specific, because ubiquinol reduced the expression of two other pro-inflammatory genes (PMAIP1, MMD) without changing the methylation pattern of the respective gene. In conclusion, ubiquinol decreases monocytic expression and DNA methylation of the pro-inflammatory CXCL2 gene in humans. Current Controlled Trials ISRCTN26780329. Coenzyme Q10 (CoQ10) is a key component of the mitochondrial respiratory chain where it is mainly known for its role in oxidative phosphorylation. The reduced form of CoQ10, ubiquinol, serves as a potent antioxidant in mitochondria, lipid membranes and plasma lipoproteins [1, 2] as well as a regenerator of other lipid soluble antioxidants (e.g. vitamin E) [3, 4]. Several studies in vitro[5–7], in SAMP1 mice  and in humans  indicate that ubiquinol is involved in inflammatory processes and lipid metabolism via gene expression. Gene expression as well as DNA methylation processes are affected by various dietary supplements and food nutrients [10–13]. Furthermore, DNA methylation is one of the epigenetic modifications that per se is able to determine the gene expression by regulating the chromatin organization [10, 14]. During methylation of mammalian DNA a methyl group is attached at the 5-position of the cytosine residue within the cytosine-guanine dinucleotides (CpG) resulting in the formation of 5-methylcytosine, which is designated as the fifth base of DNA . Although most genomic DNA in mammals is deficient in CpG sites, clusters of CpG dinucleotides (CpG islands) were described to be primarily located at promoter regions of genes . Here we investigated the effect of ubiquinol on the expression and methylation of CpG island promoter regions of pro-inflammatory genes in humans. Sample characteristics of subjects and study design have been described lately . Briefly: fifty-three healthy male volunteers, 21–48 years of age, received 150 mg of the reduced form of CoQ10 (Q10H2, ubiquinol, KANEKA Corporation, Japan) daily in form of three capsules with each principal meal for 14 days. Fasting blood samples were taken before (T0) and after (T14) supplementation. The participants had an average Body Mass Index (BMI) of 24.1 ± 2.5 kg/m2, no history of gastrointestinal, hepatic, cardiovascular or renal diseases, a habit of non- or occasional smoking and maintenance of usual nutrition habits. The study was approved by the ethics committee of the Medical Faculty of Kiel University, Germany, and was conformed to Helsinki Declaration. All volunteers gave written informed consent. Microarray experiment using the Affymetrix human genome U133 plus 2.0 GeneChip® were performed as described previously  with RNA samples from CD14-positive monocytes obtained from three volunteers before (T0) and after (T14) supplementation with ubiquinol. Based on microarray data, expression levels of selected genes including the CXCL2, MMD and PMAIP1 gene were verified by real-time qRT-PCR. Primer sequences for real-time qRT-PCR experiments were designed with Primer Express® Software 3.0 (Applied Biosystems, Darmstadt, Germany). Primer pairs were obtained from MWG Biotech AG (Ebersberg, Germany). cDNA synthesis with subsequent PCR amplification procedure has been described before . The presence of CpG islands within the CXCL2, MMD and PMAIP1 genes was predicted using the European Molecular Biology Open Software Suite CpGplot, respectively. Quantitative methylation analysis was performed on the MassARRAY® system (Sequenom, Hamburg, Germany) at BioGlobe (Hamburg, Germany) applying the MassCLEAVETM (hMC) biochemistry after bisulfit treatment of DNA samples and MALDI-TOF mass spectrometry for analyte detection. All reactions were performed according to the standard protocols recommended by the supplier. Genomic DNA was extracted from human monocytes obtained from five volunteers (H1/H1_1 to H5/H5_1) before (T0, H1-H5) and after (T14, H1_1-H5_5) using the DNeasy Tissue Kit (Quiagen). Analysis was carried out from both, forward and reverse strand. The protocol starts with a bisulfit treatment of provided genomic DNA sample, which converts native cytosine (“C”) nucleotides into uracil (“U”), whereas 5-methyl-protected cytosine residues remain as “C”. The resulting artificial sequence variation is conserved during PCR amplification using methylation independent primers. One primer for each PCR is tagged with T7 RNA polymerase promoter sequence facilitating the transformation of double stranded PCR product into single stranded RNA together with a second level of amplification. The in vitro transcription product is “U-specific” cleaved with RNase A. The generated fragments represent unique portions of the amplified region of interest and are displayed based on their molecular weight in the mass spectrum, which is acquired after sample conditioning with a MassARRAY® Analyzer Compact. Automated data analysis was performed with EpiTyper Software. Several studies in vitro and in rodents indicate that Coenzyme Q10 or rather its reduced form, ubiquinol, reduces inflammatory processes via gene expression. To study the putative link between ubiquinol dependent gene expression and DNA methylation we used probes from our human study . In this study, we found a significant decrease of LDL-cholesterol and erythropoiesis after a 14 day supplementation period with 150 mg/ day ubiquinol. Microarray-based gene expression analysis and qRT-PCR verification of selected genes identified 272 genes regulated by ubiquinol supplementation in monocytes. This gene list was used to select pro-inflammatory genes which differ in their expression levels at baseline (T0) and showed markedly differences in ubiquinol dependent regulation. Therefore, three genes encoding the chemokine (C-X-C motif) ligand 2 (CXCL2), the phorbol-12-myristate-13-acetate-induced protein 1 (PMAIP1) and the monocyte to macrophage differentiation-associated protein (MMD) were selected. CXCL2 as well as PMAIP1 and MMD are involved in differentiation processes of blood monocytes to macrophages [17–20]. Furthermore, CXCL2 and PMAIP1 are key players in apoptosis induction and inflammatory responses, respectively [21–23]. The MMD gene is highly expressed in mature macrophages but its exact biological function is not clear so far . As shown in Table 1, PMAIP1 and CXCL2 showed about 8.7 to 7.9-fold higher expression levels than MMD gene at baseline (T0) in human monocytes. Ubiquinol supplementation leads to a down regulation of the low expressing MMD gene by a factor of 1.7. The expression of the high abundant transcript of the PMAIP gene is 2.2-fold reduced by ubiquinol. Remarkably, ubiquinol decreases the expression of the high expressing CXCL2 gene more than 10-fold. Together, ubiquinol reduces the expression of the pro-inflammatory genes CXCL2, PMAIP1 and MMD. T0, expression levels before supplementation (baseline); T14, expression levels after a 14 day supplementation period with 150 mg/ d ubiquinol; fold change, relative change from time point T0 to T14; AU, arbitrary units; Data are given as mean ± SEM. There is evidence that difference in gene expression correlates with CpG island variation . In order to evaluate whether the ubiquinol dependent reduction in the expression of the CXCL2, PMAIP1 and MMD gene are linked to variation in methylation patterns, bisulfit-based and matrix-assisted laser desorption ionization time-of-flight (MALDI-TOF) mass spectrometry was used for analysing CpG islands within promoter regions of the respective genes. As shown in Table 2 and Figure 1A/ Additional file 1: Figure S1A/ Additional file 2: Figure S2A, we analysed in total 656 CpG islands which covered the promoter regions and the adjacent exon 1 of the CXCL2 (146 CpG islands), PMAIP1 (347) and MMD (163) gene. There was only weak methylation detected in the analysed CpG islands of the genes PMAIP1 and MMD before and after supplementation with ubiquinol (Additional file 1: Figure S1B-H, Additional file 2: Figure S2B/C). Most CpG islands of the CXCL2 gene were also unaffected by ubiquinol (Figure 1B/D/E). As shown in Figure 1C, the methylation status of six adjacent CpG islands (39 to 44) was reduced under ubiquinol treatment. Methylation pattern of CpG islands which are located in close proximity to this region showed no alteration before and after ubiquinol supplementation. Quantitative analysis revealed that ubiquinol reduced the methylation of CpG islands 39–44 (Figure 2) of the CXCL2 gene by a factor of 3.4. The start and end positions of amplicons refer to the genomic regions as illustrated in Figure 1 (CXCL2 gene) and Additional file 1: Figure S1 (PMAIP1) and Additional file 2: Figure S2 (MMD). Primer sequences shown in 5´ to 3´ direction are complementary to sequences obtained after bisulfite treatment and differ from the original genomic target by exchanging each “C” with “T”. f, forward direction of the amplicon; r, reverse direction of the amplicon. Position of amplicons within the analysed genomic region (A) and methylation status of CpG islands (B-E) of the human CXCL2 gene. A, The genomic region of the CXCL2 gene is located from −365 to +450 relative to the gene start. This refers to position 74964548–74965362 of the NCBI’s human genome build 37.1. The gene is shown in its transcripted orientation and locates on the sense strand of chromosome 4. Colors illustrate position of the gene (blue), mRNA (green), region for amplicon design (orange), amplicons (yellow) and annotated (Ensembl) regulatory region (pink). B-E, Colored dots indicate the methylation ratio (%) at each analyzed CpG-unit within each amplicon. Samples are indicated as H-1 to H-5 (time point T0) and H-1_1 to H-5_1 (T14). Base count (upper ruler scale) and CpG-site numbering (lower ruler scale) refers to the analyzed strand in 5’→3’ orientation of the analyzed amplicon sequence. Sample “nc_001” represents the reaction negative control (water) and “con42” a control DNA. 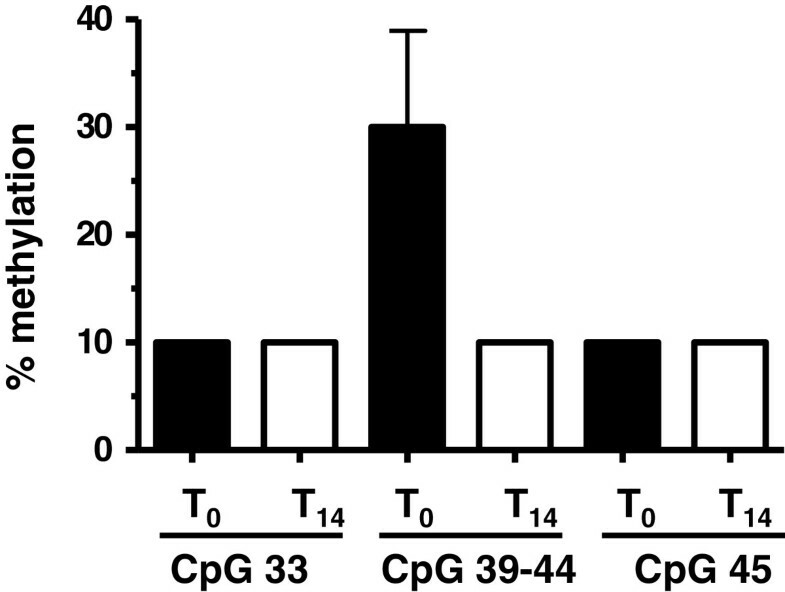 Methylation status of CpG islands of the CXCL2 gene in monocytes of human volunteers before (T 0 ) and after (T 14 ) a 14 day supplementation period with ubiquinol. The extent of methylation (%, mean ± SD) of CpG islands 33, 39–44 and 45 within amplicon 2 of the CXCL2 gene (see Figure 1C) is shown. Our study provides a first hint towards a modifying effect of ubiquinol on DNA methylation in humans. This effect is in line with another human study demonstrating that a supplementation with a mixture of CoQ10, niacin and riboflavin reduces DNA methylation of the tumor suppressor gene RASSF1A in breast cancer patients undergoing tamoxifen therapy . Moreover, literature indicates that global methylation patterns are affected by several other dietary supplements and micronutrients [27–32]. The effect of ubiquinol on DNA methylation seems be rather gene specific because we identified two genes (PMAIP1, MMD) which are regulated by ubiquinol without changing DNA methylation. A recent SAMP-mice study from our group  found that ubiquinol alters hepatic expression of PPARα target genes without influencing DNA methylation in the respective gene promoters. The effect of ubiquinol on DNA methylation might be linked to the extent of ubiquinol dependent alteration of gene expression. In the case of the CXCL2 gene, ubiquinol reduces its expression more than 10-fold accompanied by a reduced methylation status within certain CpG islands. This finding seems to be contradictory to common models of gene expression, because increased DNA methylation of a gene leads to reduced expression levels , whereas demethylation correlates with the transcription of the gene . On the other hand there is evidence, especially in cancer cells, that DNA methylation status does not correlate with gene expression [36, 37]. However, the mechanism regarding effects of ubiquinol on DNA methylation and expression remains unclear and has to be studied in the future. The reduced expression of pro-inflammatory genes under ubiquinol supplementation supports recent findings from our lab [5, 6, 8, 9, 38–41] and other groups [42, 43] suggesting that CoQ10 displays anti-inflammatory properties. As a summary, we found in a human intervention study that ubiquinol decreases expression and DNA methylation of the pro-inflammatory CXCL2 gene in monocytes. Further studies will be necessary to investigate the mechanistic link between ubiquinol dependent gene expression, DNA methylation and inflammation. AF and CS carried out the experiments and collected the data. SO analysed the data and wrote the manuscript. FD designed the study and drafted the manuscript. All authors read and approved the final manuscript.